The Monk Job, Hegumen of Pochaev and Wonderworker (in the world named Ivan Zhelezo), was born in the mid XV Century in Pokut'a in Galicia. At age 10 he came to the Transfiguration Ugornitsk monastery, and at age 12 he accepted monasticism. The Monk Job from his youth was known for his great piety and strict ascetic life, and early he was accounted worthy of the priestly dignity. In around the year 1580, at the request of the reknown champion of Orthodoxy prince Konstantin of Ostrozhsk, the Monk Job headed the Cross-Exaltation monastery near the city of Dubno, and for more than 20 years he governed the monastery amidst the setting of the growing persecution of Orthodoxy on the part of the Catholics and Uniates. At the beginning of the XVII Century the Monk Job withdrew to Pochaev hill and settled in a cave not far from the ancient Uspenie-Dormition monastery, famed for its wonderworking Pochaev Icon of the Mother of God. 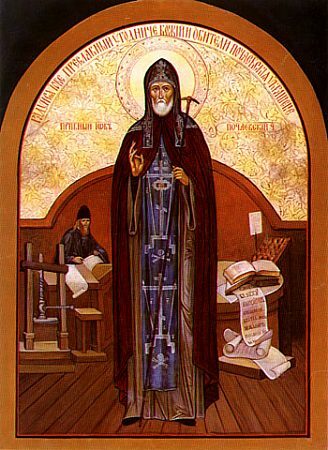 The holy hermit, beloved by the brethren of the monastery, was chosen as their hegumen. The Monk Job zealously fulfilled his duty as head of the monastery, kind and gentle with the brethren, he himself did much of the work, planting trees in the garden, and strengthening the waterworks at the monastery. And in taking an active part in the defense of Orthodoxy and the Russian people, the Monk Job was present at the 1628 Kiev Sobor-Council, convened against the Unia. After 1642, the Monk Job accepted the great schema with the name Ioann. Sometimes he completely secluded himself within the cave for three days or even a whole week. The Jesus Prayer was an unceasing doing of his gentle heart. According to the testimony of his student and author of the Vita-Life of the Monk Job, Dosithei, once during the time of prayer the cave of the monk was illumined by an heavenly light. The Monk Job reposed in the year 1651, at over age 100, having directed the Pochaev monastery for more than fifty years. On 8 August 1659 occurred the glorification of the Monk Job.